RSM Federal, a federal advisory and strategic marketing firm, was honored last week at the SBA’s annual award's luncheon as the 2016 Veteran Business of the Year. The award is the result of RSM Federal clients and FA Members winning more than $1.5 Billion in government contracts. 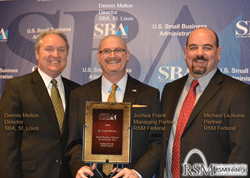 RSM Federal, a federal advisory and strategic marketing firm, is pleased to announce that the company was honored on May 5th at the SBA’s annual award's luncheon as the 2016 Veteran Business of the Year. Each year the SBA honors small businesses that are making an impact in their communities. Small businesses account for 64% of new job opportunities and employ over 99% of the U.S. workforce. This particular award category highlights the fact that RSM Federal has been highly successful in helping other businesses win government contracts. According to the SBA, Veteran owned businesses account for approximately 9% of all U.S. firms and are responsible for over $1.2 trillion in sales while employing over 5.7 million employees nationwide. RSM Federal provides companies with business advisory and coaching services that are designed to help companies find and win government contracts. Unlike bid-matching systems and services that are only geared at finding opportunities, the Federal Access Program teaches companies how to differentiate, position for, communicate competitive advantage, and win new government contracts. Federal Access’ success is due to being one of the few programs in the market that teaches companies how to engage opportunities, not simply how to find them. “Anyone can find government opportunities and in fact, there are hundreds of websites and companies that you can use to find state, local, and federal opportunities. The real value comes from knowing what to do once you find the opportunity. How you convert an opportunity to a contract win is the only thing that counts and that’s exactly what we do for our clients and members. On average, our clients improve their proposal win rate by 42%, 90% of our clients get on the team they want, and our client success rate is 95% in the government market versus the average of 10% who go it alone. And by the way, our client’s entry and success in the market is 73% faster.” – Stated Joshua Frank. RSM Federal, founded in St. Louis in 2008, is a federal business development and strategic marketing firm that represents businesses in order to educate, accelerate, and maximize revenue. Our firm develops and executes, in concert with our clients and members, an aggregated education, sales, and marketing strategy to achieve corporate funding and revenue objectives. We support clients, both private and public sector, with comprehensive and professional services to better understand and exploit government opportunities.